a little lusciousness: MMM MUSSELS!! 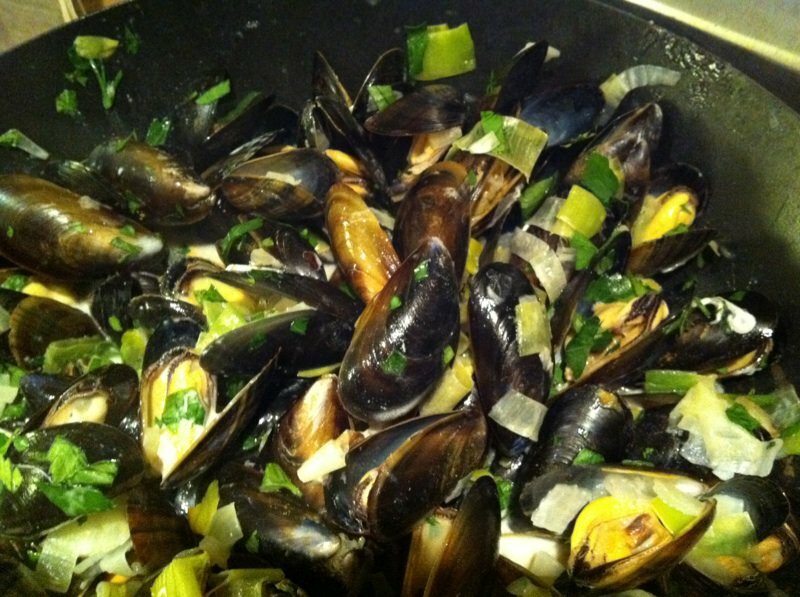 Mussels take a bit of time and effort to make sure they are delicious, but it is so worth it! It only takes ten minutes or so, but after you’ve bought your 2 kilograms of mussels from the local supermarket or fishmonger you need to wash and ‘de-beard’ them! Run a cold tap over the mussels, and picking out one by one, you’ll find a hairy looking bit that comes out of the side of the shell. You need to grab this from as close to the shell as possible and yank it out. Do this for all the mussels, throwing out any mussels that are already open. Chop 2 cloves of garlic, one onion and 2 leeks into small cubes. Chuck in a very large saucepan with a good glug of olive oil and cook down for ten minutes or until they are soft and smelling amazing. Add a quarter of a bottle of good white wine and simmer for 1 minute. Next add the clean mussels, put a lid on and let them steam for 3 or 4 minutes, or until they have all opened. Any that haven’t opened, throw away. Now add two spoonfuls of crème fraiche and some fresh parsley, mix and leave on the heat for another minute. Serve with crusty bread and lots of napkins. Remember to put an extra bowl on the table for empty mussel shells.